"Yeah, we know right where she is. Just pull up Sizzler!" Certainly, Paparazzi is not a card for every deck. Being tagged means you are in Scorched Earth range, which means the corp can trash it, meaning that (as ninjaiguana pointed out) they can just trash it and move on. What's the point? The point is, it's not unique. That's right, you can have up to three Paparazzi out at one time. And the wording on Paparazzi is deliberate: "you are tagged". You don't have a certain number of tags, meaning it doesn't count for Psychographics or Traffic Accident (although your normal tags from Midseason Replacements and Account Siphon still count, obviously). But to get three out, you need to play them in advance, meaning you need to be playing the "tag-me" archetype that has gone out of style recently. You need to be playing an event-heavy econ, and your only resources should be things you want trashed. The good news is you can also take advantage of some underused Anarch cards like Joshua B., Activist Support, and Data Leak Reversal; these cards force the corp to react to you by trashing your stuff. Paparazzi plays into this strategy nicely; it's another cheap resource that they have to deal with, and until they do you are immune to Weyland's methods of killing you. This strategy could very well return with the introduction of Wireless Net Pavilion in the next data pack; if you can get up two or more WNPs, then it becomes prohibitively expensive for the corp to trash your stuff, especially if you have a few Fall Guys set up. If you have a Fall Guy, two WNPs and two Paparazzi up, it will cost the corp a whopping 18 and 3 before they can hope to burn your house down. And if you've been hitting them with Joshua B. and Data Leak Reversal, they might not be able to handle it. Oh, and just as a slight bonus: your crowds of adoring fans make it much cheaper to get your Net-Ready Eyes installed. Don't think about the flavor of that one too hard. It's worth noting that this card doesn't give you a tag - it /is/ the tag. That is to say, when this card goes, so does the tag it generates. 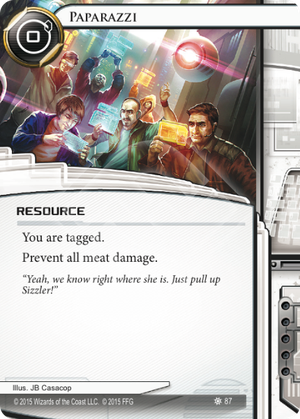 Until the corp destroys it, you are immune to meat damage, period - and if it does, the tag it gave you is gone. So this is kind of a pointless card, to my mind. What it's basically saying is 'Butcher Shop and similar decks have to pay 2 and 1 extra to kill you for each copy of this card you have in play'. So it's a tax, I guess? But it's so small and situational that I can't really see it being important. Not great.